Add some elegance to your casual dining space with the Atrium collection. 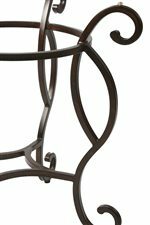 Crafted from heavy duty 16-gauge steel construction and then beautifully paired with glass and wood accents, this collection offers pieces for your eating area that will last for years to come. 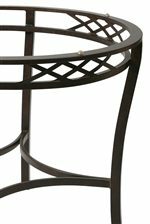 Metal table bases are beautifully detailed with scrolls, crisscross designs, and gentle shaping to lend a softness to the sleek material. Choose between a pedestal or leg table base and then top it with a round glass or wood top. Either way, the outcome is divine. Two seating options allow you to kick back at the end of a long day and enjoy good food and conversation with friends and family. 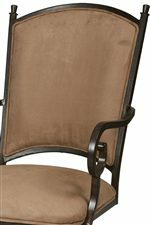 Upholstery on both the side and caster chair are finished in Topanga Brown fabric, bringing a neutral color to your home that will beautifully blend with any existing décor. Creating a calming space in your dining room or kitchen nook with the Atrium collection. Browse other items in the Atrium collection from AHFA in the area.